The planners are asking for on-site renewable energy for new buildings. Many are following The Merton Rule which requires new developments to generate at least 10% of their energy needs from on-site renewable energy. Combined Heat and Power X X X low 24/7 Releases CO2. Photovoltaics convert sunlight into electricity with an efficiency which has been as low as 10% but new technology is improving this: this option can be considered where the use of electricity matches periods of sunshine or where electricity is required some distance from a publicly available supply. There is a risk that the payback period may be longer than the life of photovoltaic panels. Wind turbines can convert wind into electricity – when a constant wind is blowing at near to the optimum speed. The electricity generated depends on the strength of the wind which may not match the electricity demand profile of your building. Electricity is difficult to store, although you may be able to sell a surplus to the Grid (at a low price) and can buy electricity (at a higher price) when the wind is not blowing. You will need to allow for planning permission on large installations. Generally the electricity generated by a wind turbine increases with the wind speed, the size of the blades, the height above the ground, the distance from other buildings and the distance (in the UK) from London. Combined Heat and Power systems generate electricity from burning fossil fuels and capture the heat generated in the process for heating purposes. Although CHP burns fuel and releases CO2 it can work with high efficiency and therefore releases fewer greenhouse gases than remote fossil-fuel-powered electricity generation which usually wastes the heat produced as a by-product of generation (and also wastes some electricity in transmission to your site). CHP can be used where there is a significant year-round need for heating, in addition to the electricity generated. The uncomfortable reality is that a CHP installation usually wastes heat in summer. The solution is to store surplus summer heat in a Thermal Bank™ for use in winter. Burning biomass does not consume fossil fuels, but it does release CO2 into the environment (66% more than burning gas, 21% more than burning oil for the same quantity of heat). Biomass boilers require on-going management and maintenance as well as space for installation, fuel delivery and fuel storage. They take time to heat up and cool down, but can be made to work if there is a ready supply of cheap local biofuel. There is increasing concern that biofuel production may divert land from food production and forestry and this could raise as many sustainability issues as it is trying to solve. The price of MDF and other wood based materials for construction has risen since subsidies for burning biomass were introduced. You need to consider the element of embedded carbon in the transport costs – especially if the biomass fuel is imported. Consider the effect on air quality of burning biomass in cities. Biomass is not able to provide any cooling. Solar water heating – "use it or lose it"
Solar Thermal Collectors heat water to provide domestic hot water: these mechanisms can capture heat efficiently and can be effective where a high volume of hot water is needed at the same time as the sun is shining. Retrofitting is often an option. Problems arise when hot water is needed at a different time from when it is collected, as it is difficult to store heat over a period. Heat can be stored overnight in hot water tanks, but if heat is not required when it is collected it will probably be wasted. The best time for heat collection (in the long hot days of summer) may not match the time of greatest need (in the long cold nights of winter). Overheating can also arise when there is no hot water demand in the peak collection period – summer holidays – as it is not possible to switch off a solar collector. A Heat Pump can separate warm temperatures into hot and cold: the heat obtained may be 3 or 4 times the amount of electrical energy needed to run it. A Ground Source Heat Pump draws heat out of the ground by means of water circulating in pipes beneath the ground: as the ground gets colder the Heat Pump must work harder to obtain the heat required. A GSHP issues no CO2 on site – nor any other gases. If there is no active mechanism to replace heat taken from the ground it will take time for heat to migrate toward the “heat overdraft” created. This is a key problem for Ground Source Heat Pump systems: heat only moves very slowly in the ground. The solution is below. ICAX adds an Asphalt Solar Collector and a Thermal Bank™ to a heat pump, interfaced with a sophisticated electronic control unit. 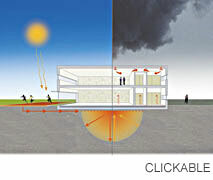 Surplus solar heat collected in summer is deposited in the patented Thermal Bank™ in the ground. This raises the temperature of the Thermal Bank from the natural temperature of the ground, 10°C, to over 25°C over the summer months. In winter the heat pump draws warmth from this Thermal Bank in place of starting with a cold temperature from the ground. This allows the heat pump to generate more heat from less electricity. This doubles the Coefficient of Performance and transforms the economics of the heat pump. In comparison to a standard GSHP installation ICAX provides a short cut to the primary power source – the sun. ICAX uses the same equipment and mechanisms in reverse to provide cooling to buildings – at a much lower cost in electricity and CO2 than traditional air conditioning equipment. IHT™ is powerful, invisible, efficient and in tune with the natural environment. The carbon content of the electricity grid has fallen by over 50% since 2014. This dramatic shift points to the acceleration of the move to electrification of heat: this means employing heat transfer instead of combustion. See Professor David MacKay on Sustainable Energy – without the hot air. See Independent Report on IHT by Transport Research Laboratory.